“This Year 2019 too, Mumbai kites festival will experience a varieties of kites of various shapes and arts in city and suburban locations. Enjoy the festival and always keep some soft corner for those beautiful birds by saying NO TO CHINESE MANJA, that’s it. Every person in Mumbai who tried flying kites or enjoy as spectator of those competitive kites fighting high in the sky will love to be at home taking a day leave from routine job or adjusting some time from business. ‘Makar Sankranti’ is the only Kite festival in Mumbai which is hardly celebrated like Gujarat with fun, music and food, is not to be missed. The ancient mythological describe this festival of kite in a very different way. It were not these kites for which reason Makar Sankranti is celebrated, But was all about the powerful solar body ‘SUN’ which is said to visit its son called ‘Shani Dev’ who resembles to be Guru of Astro (Rashi) called ‘Makar’ as per Hindu calendar and (‘Capricorn’ as per English Calender). Significantly its a day of responsibility and promise by son ‘Shani’ to his father ‘Surya’ (SUN) to Adhere and keep alive all dreams of father and fulfil it. In simple terms ‘Makar Sankranti’ is festival of celebrating ‘Father & Sons Day’ all around India and not just in Mumbai city. This festival also represents end of negativity, as Lord Vishnu fought and ended the terror of evil Asuras on this day. So how kites came into existence when mythology story about Makar sankranti is so different and how TODAY people celebrates this festival of kites in sky ?. Within India their are some hundreds of castes and communities and sub-communities having different stories for every festival. Same way Sankranti festival is related to Kites in the way said by someone is different compared to what other might say. Let us understand one of the reasons how Kites are related to Sankranti festival and how is it celebrated in Mumbai city. In simple terms, if you have heard about Navratri festival (Famous for Dandiya & Garba Dance). Similarly their is ‘Vasant Navratri’ which is a special festive period as per Hindu’s which starts in January every year. Goddess Saraswati the goddess of Money is worshipped and with relation to SUN, people offers rituals in the form of multiple colour flowers and since its the SUN in the sky, People invented and related flying kites of different shapes, size and colours which is fun in festive and a form of Offerings to SUN. In short the colourful offerings are in the form of those kites and so now our modern world calls it a ‘Kites Festival’. Sure Mythology has its relevance for festivals, But kids and also youth are excited in the fun part of it and for this one, flying kites and competing with other kites in sky by cutting of others thread is actually a kind of achievement per say. It is an interesting race of kites where the strength of colourful and sharp threads works wonders and cuts the competitive other flying near by in sky. If you trust me experience of this competitive festival, it is not just the strength of those threads, But a special skill that is require where on pulls the threads faster enough to make an impact on competition and cut with high energy and power which is called ‘Khechi’ or ‘Ghasit’ in local language. Fancy Kites of varied colours, shapes and sizes are now available in market starting as low as Rs.10 to Rs.100 and more depending on the artwork, shapes and sizes. Its a kind of pride to fly a beautiful looking big kite from roof top or usually a terrace of residential buildings. Fun begins early morning around 7 Am as the excitement will not last more than a day and for those who took off from jobs can’t miss any as Kites festival is not a public holiday officially. Things starts with preparing ‘Kuttni’ which is a special nod work of thread that actually stables the kite in the skies. Kites which is also called (‘Patang‘ in Hindi) and the thread wheel which is called (‘Firki‘) with colourful and sharp threads called (‘Manja‘) are made ready and the gang reaches building terraces with enough food, water and music for fun. Often balconies are also used to fly for which the only requirements are the open sky area in front and the wind directions. Mumbai’s suburban like Borivali, Kandivali, Malad, Jogeshwari and Bhayander see’s most kites in the sky that particular day. Keeping aside the rituals etc, When it comes to flying kites there is NO CASTE, COMMUNITY and RELIGION here and just pure fun or racing and kite competition. Muslims, Gujarati’s, Marathi’s or any cast you say are here to take all fun of this festive season. The fun and excitement of kites festival is so high that people don’t even prefer to come down for lunch too. Special lunch and food arrangements are done on terraces by society or group of families with loud Speakers playing rocking music till late evening. Family and friends group celebrates this festival at most open grounds too and not just building terraces. Newbies learns to fly and prepare ‘Kunni‘ (the basic threading on kite) under seniors observation. As said perfect ‘Kunni’ making is very important to keep kites fly steady and make twists & turns as and when required during competition. Not just middle class and riches enjoy this festival by spending good amount of money on kites and threads, The fun of catching and grabbing on the kites which lost the battle and comes down flying is also high. Those poor kids in Mumbai city who cannot afford buying costly kites, Juggles and jumps out in open with long sticks to catch hold of those kites who lost competition and are been cut of which falls down the ground. If one thinks it is done after sunset or dark then NO, Mumbai kites festival just changes its mood after dark. Fire balloons which is nothing but a small handy version of the famous sport ‘Hot Balloon Ride’ are set ready and the breeze takes away them in groups and the scene in the dark is to be observed. Same fire balloons (Few also call it ‘Fire Kites’) are tied with a stable kite which is floating in air since evening and the series of 10 to 15 such makes a great view in sky. This goes till late in night. 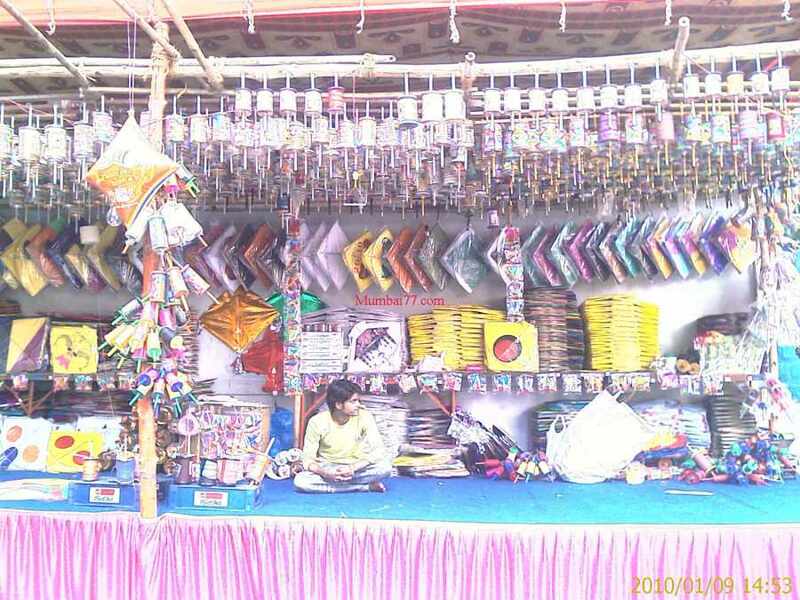 Kites are sold at various shops at every other lane in Mumbai. Few sellers put up special stalls (See Picture inside this article) or and few keep it specially for the day. Along with it are sold those MANJA. Powerful and effective coloured Manja’s are Pink, Chocolate and Grey which are thin and sharp. Since last 2 decades shops introduced those imported ‘CHINESE MANJA’ which are very sharp and harms birds, Actually we can call it a bird killer threads which are hard to cut with naked hands. 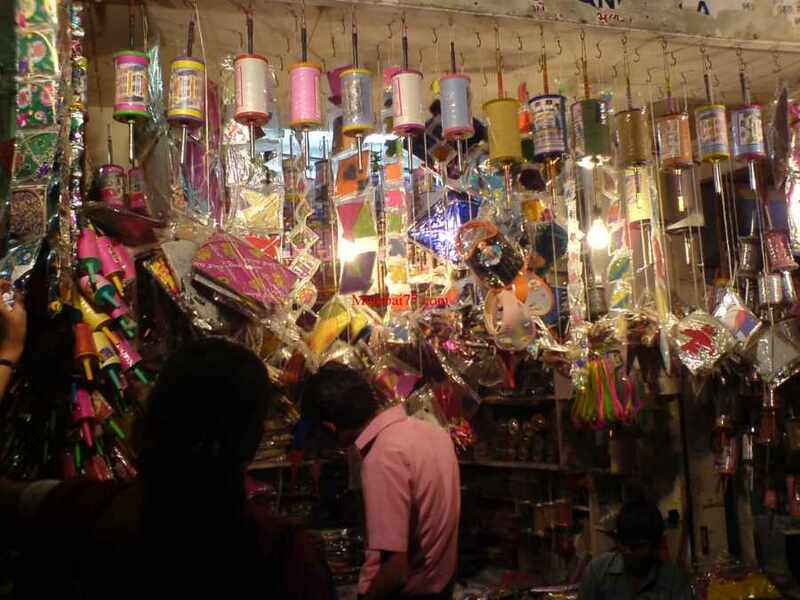 There are wholesaler and retailers all over Mumbai, Yet famous places for cheap purchase of kites and manja are Masjid Bunder, Mohd Ali Road and Dongri all in South of Mumbai where special shops and street side stalls are set up prior 10 to 15 days of Makar Sankranti, The kite festival day. Checkout these pictures from Mumbai suburb. We human are really selfish at times. Just for fun of flying kites for a day or few, in the name of ‘Makar Sankranti Festival’ celebration, we ignore the greatest back fall of HURTING BIRDS, not only those birds are badly injured, Many are literally killed by those sharp threads that strangles around specially in neck. For them kites are some wearied new object flying in the sky and they get scared from this invaders. They run for life and often gets trapped inside Flying Manja’s or get cut as cannot see the raised and connected threads high in the sky. These birds are victims of the Human Made kites festival and specially of those ‘CHINESE THREADS’. ‘CHINESE THREADS (Manja)’ are used by few stupid and heartless people as these threads are more sharp and powerful to cut of other competition in the sky. Not to forget, humans have fall victims to Chinese Manja and many throats have already been cut. TRY RIDING BIKES ON KITES FESTIVAL DAY, Specially at locations where major fly. Gujarat see’s major human bike rider victims. Remember, Helmets do not help here. These powerful and sharp threads can cut off human neck and many are hospitalized and in emergency. Every year NGO’s and bird lovers try helping birds and educate people of the facts. Its a mater of choice of life over fun not just in Mumbai city but all around India. REQUEST, AT LEAST please don’t use ‘CHINESE THREADS’. Similarly their are ‘GLASS DUST COATED Manja’, the threads which were famous since decades and was lately discontinued since its cuts fingers of flyers and also harms birds. Contact NGO’s for animals at below numbers if you find any hurt bird or animals. Below are helplines for Mumbai locations. Kai Po Che : This is a very famous slang, Specially by Gujarati community, which proudly means ‘Yeah, I have Cut Your Kite’ and its my victory. Kanni / Kunni : The Knot with 4 holes tied with same or other thread / manja, It should be tied properly for a steady flying kite. This knot is connected to main string (thread). Manja : This hindi word means string or thread used to fly kites. Firki : The rounded reel with extra sticks out to catch between two hands, made up of wood or plastics that carries the thread / manja / string. Dheel De : A direction to FIRKI holder saying let the strings out for ease. Ghasit : With in competition, Ghasit (Or Pulling of threads faster) to make an impact on competitive kites thread. The one who pulls the thread faster will cut the other slow flying kites thread as the impact and speed is higher. LAPET : Now, the word LAPET has 2 different meaning, for kite flying it means roll up back the strings into FIRKI. And the Mumbai slang for same means ‘LIER’ (means you not telling truth). Note : If ONLY you are already at Virar, A small time Kite Festival Competition is held yearly. But not sure if it continues every year now. Priyadarshini Park is another place to keep watch of special kites competition held yearly.